All Hands restaurant in Williamsburg offers a menu from chef Pete Lipson (Northern Spy Food Co.) that highlights seafood. Look for dishes like grilled octopus with braised yucca and Castelvetrano olives and swordfish steak with grilled leeks and piccata sauce. All Hands, 29 Dunham Place, Brooklyn, NY 11249, 718-963-0078. Lady's is the new downtown Brooklyn spot from Sweet Nuthin’ Hospitality Group (No. 7 Restaurant, Weather Up). The menu is all about pizzas and pastas like chestnut campanelle and corzetti with sausage. Cocktails are creative takes on classics. Lady's, 572 Fulton St., Brooklyn, NY 11217, no phone. Jerome Dihui, previously a chef at Pastis, has opened a French brasserie in the West Village. Boucherie will serve classics like roasted snails with garlic butter and dry-aged New York steak from the in-house butcher counter. Located in the former Circle Repertory Theater space, the restaurant seats 320 people. Boucherie, 99 7th Ave. S., New York, NY 10014, 212-837-1616. Chicago restaurateur Brendan Sodikoff, known for his burger from Au Cheval, has opened his first New York City restaurant in the West Village. 4 Charles Prime Rib will serve steakhouse classics, a burger and a gigantic sundae for dessert. 4 Charles Prime Rib, 4 Charles St., New York, NY 10014, 212-561-5992. The poke craze continues with the opening of Maui Onion Poke Bar, from Donna Kang and Il Ji Jung. Twelve different poke options, like octopus with seaweed salad and serrano chili, are available in either a bowl, burrito, hand roll or salad. Lunch & Dinner daily. Maui Onion Poke Bar, 35 W. 26th St., New York, NY 10010, 212-377-5120. 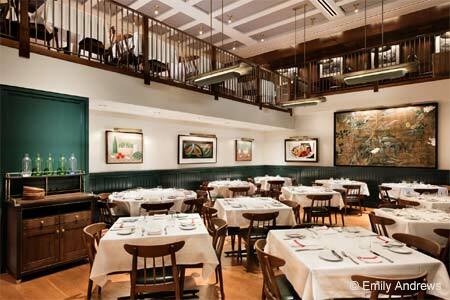 Seventy-five-seat Parisian-inspired bistro Little Frog is the project of Minetta Tavern alum chef Xavier Monge. It’s located in the former home of Italian restaurant Sotto Cinque. The menu includes dishes like pork belly with Spanish lentils, steak tartare and braised short ribs. Dinner nightly, Brunch Sat.-Sun. Little Frog, 322 E. 86th St., New York, NY 10028, 347-537-5786. Wine bar and small plates restaurant Denizen in Williamsburg focuses on all things cheese. The menu includes chopped chicken livers with foie gras and burrata with broccoli pesto and white anchovies. It’s a venture from former The Modern bartender Liam Seide, wine director/partner Chris Wilford (Triomphe), executive chef John Poiarkoff (The Pines) and fromager Emily Lindh (Casellula). Dinner nightly. Denizen, 88 Roebling St., Brooklyn, NY 11211, 929-337-6412. Union Square Cafe, Danny Meyer's once-pioneering restaurant, has re-opened in a new location with a new menu, private dining space and more. Union Square Cafe, 101 E. 19th St., New York, NY 10003, 212-243-4020. 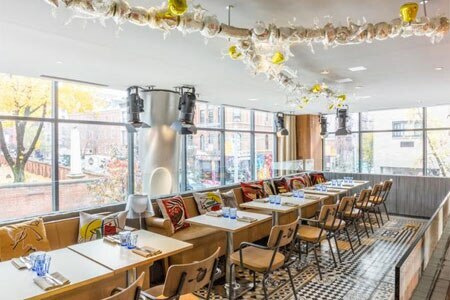 French restaurateur Claude Louzon and his daughter Julie collaborated with architect Philippe Starck for Miss Paradis, their 116-seat Soho version of health-focused restaurant Le Paradis du Fruit. The new, two-level spot inhabits a plot on Prince and Mulberry that used to be a parking lot. Chef Adir Cohen serves veggie and fish-focused dishes, and an expansive dessert menu including tasting options. Miss Paradis, 47 Prince St., New York, NY 10012, 646-329-6380. Owners and siblings Galit, Tomer and Dr. Alon Seifan, who worked in Cornell’s neurology department, focus on healthy food at Honeybrains. Expect menu options like avocado toast with hemp and chia seed salt and bowls with buckwheat soba and raw veggie slaw. They will host lectures on brain health in their restaurant. Breakfast, Lunch & Dinner daily. Honeybrains, 372 Lafayette St., New York, NY 10012, 646-678-4092. Former ABC Kitchen chef’s Dan Kluger's anticipated solo restaurant Loring Place is set to open in December 2016. The 120-seat restaurant will focus on veggies, pizzas and pastas, like a dish of cauliflower roasted with Indian spices, ginger and garlic, then fried until crispy. Loring Place, 21 W. 8th St., New York, NY 10011, 212-388-1831. A new location of Serafina, the NYC-based Italian restaurant chain, has taken over the former 'Inoteca space on Ludlow. The spot will serve their classics, like pizza, rigatoni bolognese and lobster spaghetti. A wine room on the lower level seats 12. Serafina, 133 Ludlow St., New York, NY 10022, 212-358-9800. After changing menus many, many times (from all burritos to Vietnamese breakfast), Danny Bowien’s Lower East Side restaurant Mission Cantina has closed. Mission Cantina, 172 Orchard St., New York, NY 10002, no phone. Midtown restaurant Betony closed for good on New Year’s Eve. The owners have not offered any explanation for the closure, or shared any plans to reopen. 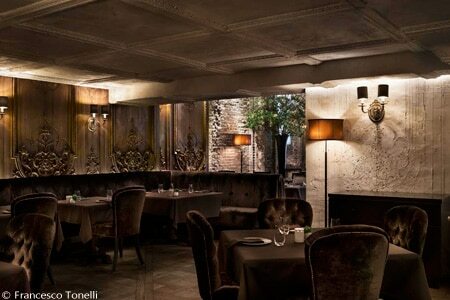 Betony, 41 W. 57th St., New York, NY 10019, 212-465-2400.